Real estate advertising is a very tricky affair and most of the realtors never get it right at the first go. However, those who have invested in real estate magnets are finding it lot easier to grab attention than the ones, who haven’t. This is because they are choosing the right direction. Keep reading to know why. We all are familiar with real estate advertisers handing out brochures, notepads and other promotional items during trade conferences and other promotional events. However, these gifts lose their charm with time and end up being a crap or an office stationary. Whereas real estate magnets rarely lose their charm and they help customers by their small means. In this highly competitive real estate market it is very important to remain in sight and pop at the right time whenever a customer decides to invest in a property. And real estate magnets differ from other gifts because they remain right before the eyes, until a customer wishes and also transforms their refrigerator or car doors into meaningful places. Realtor magnet is an umbrella term, which refers to big collection of magnets used for various real estate advertising. Today, real estate marketers ranging from startup construction firms to real estate agents can choose from various types of magnets depending on their need. 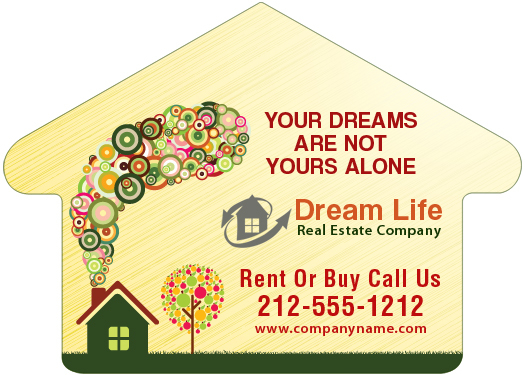 If they wish to make impressions as they go then they can go for real estate car magnets or if they wish to get closer to the home audience, then they can go for real estate business card magnets, and many more. Real estate calendar magnets, real estate sold sign shape magnet, home shaped calendar magnets or home shaped business card magnets are some of the popular choices under this category. Marketers always have a big room to explore and they can try some gimmicks such as large texts or discount offers or other beneficial offers to buy customer attention. For desired results it is always advisable to make best use of every single opportunity that comes their way. They can either choose to hand out real estate business card magnets or real estate calendar magnets during any promotional events or they can use the real estate car magnets for promoting during tradeshows. Remember potential clients may be interested to buy from you only if you are able to market yourself impressively. So, try to use these magnetic tokens such that they evoke maximum response from your targeted customers. With so much happening with magnetic advertising you can easily invest in real estate magnets that work for you and help to close good sales in this season.